Why would you reinstall your OS? Well maybe you are having some glitches or technical issues with your phone. Or perhaps you are trying out the Windows 8.1 Dev Preview and wish to return back to culturally acceptable Windows Phone 8? Well this recovery tool will erase everything on your phone a do a complete reinstall of Windows Phone 8. It’s called the Nokia Recovery tool and it allows you to reinstall the latest released version of your Nokia’s Windows Phone 8 software to your phone. If you use SkyDrive or some other file sharing servicing, you may have realized that these services come with upload restrictions. SkyDrive is 2GB and Google Drive is 10GB (Microsoft are you listening?) 7zip, my favorite & free file compression utility, offers to split large files into multiple smaller ones based on a maximum file size. (Did I mention it is free?) This is real easy to do in the full 7zip software as shown below. Any files over 2GB are split into file.7z.001, file.7z.002, file.7z.003 (not their real names). You can later use the 7zip program to recombine them into one file or directory again. Right click the file you wish to be smaller so it uploads successfully & select Add to Archive. 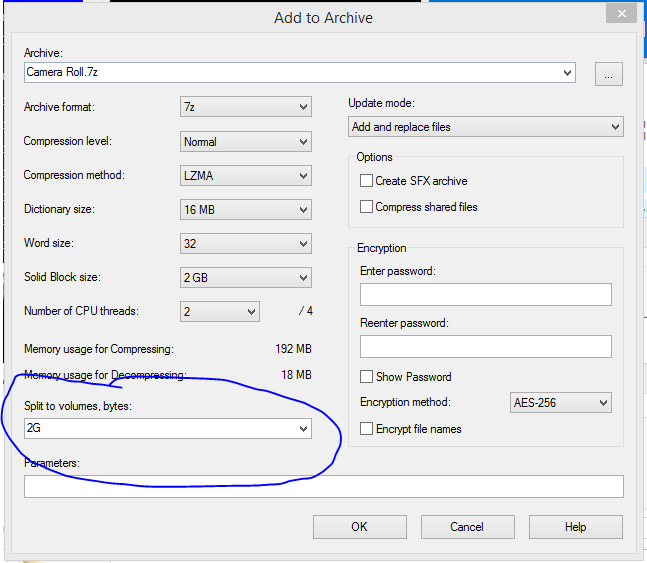 The specify in the Split Volume bytes field a value of 2GB or in the case of SkyDrive/OneDrive 1900M to be safe & below the threshold. So now you can always have an archival copy of all your data on SkyDrive, but be warned, you may have a lot of split files to merge back together if you ever need to restore them.